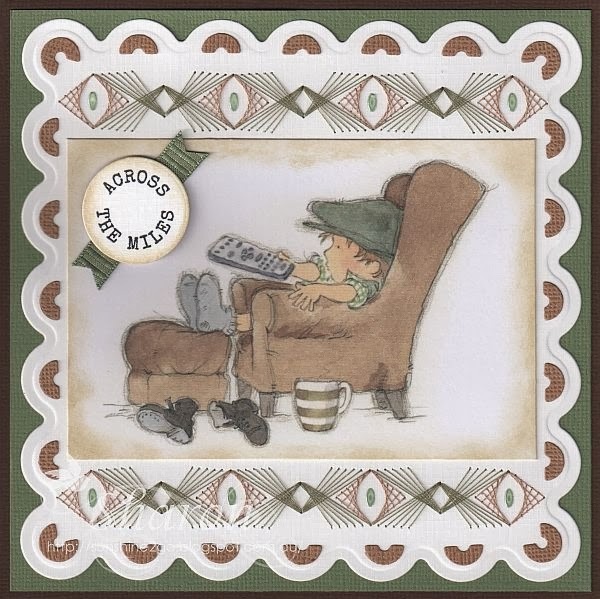 My December exchange card was made for Andreas, who is Sonni's husband. 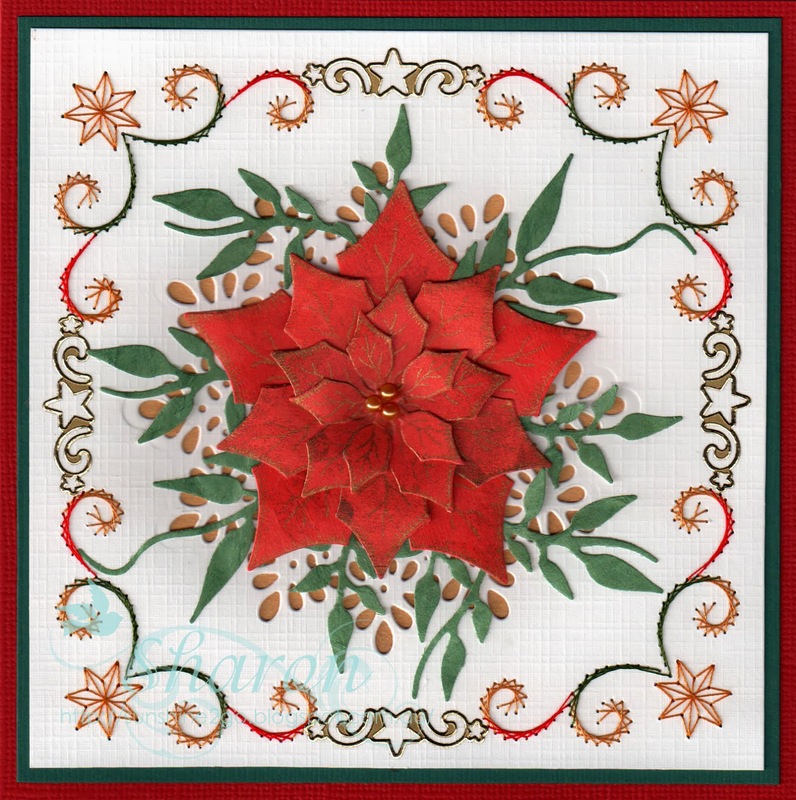 This pattern by Ann's Paper Art is fantastic for those cards where you don't want to do much stitching. The pattern number is a354. The threads are Mettler Polysheen 0453 and 1123. "Vintage Boys" by Lili of the Valley as all men love to hold the remote!! I distressed around the edge with antique linen. The base card is die cut with Spellbinder Grand Scollop Squares LF-127. I also used the inserts of the Nellie Snellen mfd033 to make the brown bits in the scallops. I have also used ribbon and hobbydots. 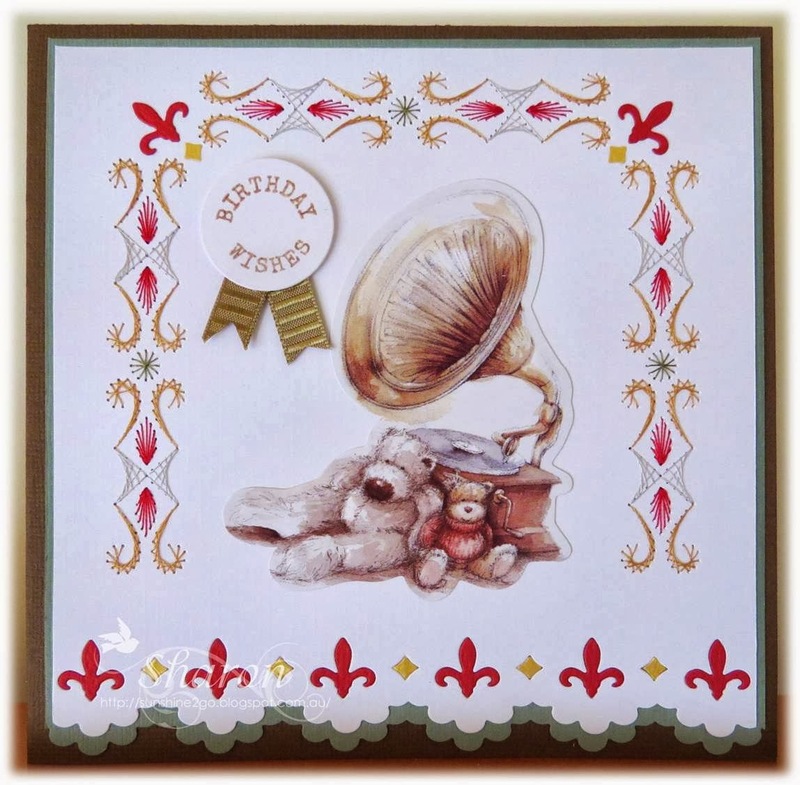 I enjoyed creating this very special card and I am so pleased with the way that it all come together. I hope that you like it also. It is hard to believe that Christmas is just around the corner. This month I will be showing you some of the Christmas cards that I have made for 2013. 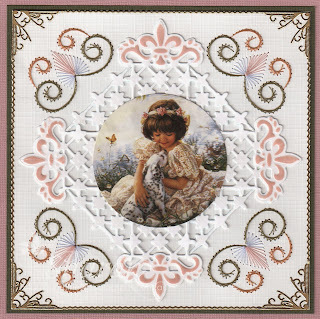 This pattern is an older one yet a beautiful one, it is from Ann's Paper Art Hobbydol 21, pattern #528. Threads are Mettler Polysheen 0824,1902,5933. 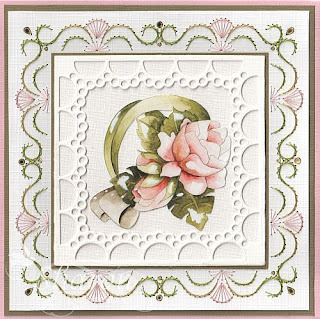 The background die is Spellbinder, Delicate Doilies S5-205. I created the leaves with Joy "Billies Flourishes" 6002/0263. The stickers are Doodey Star Ornament #7088. 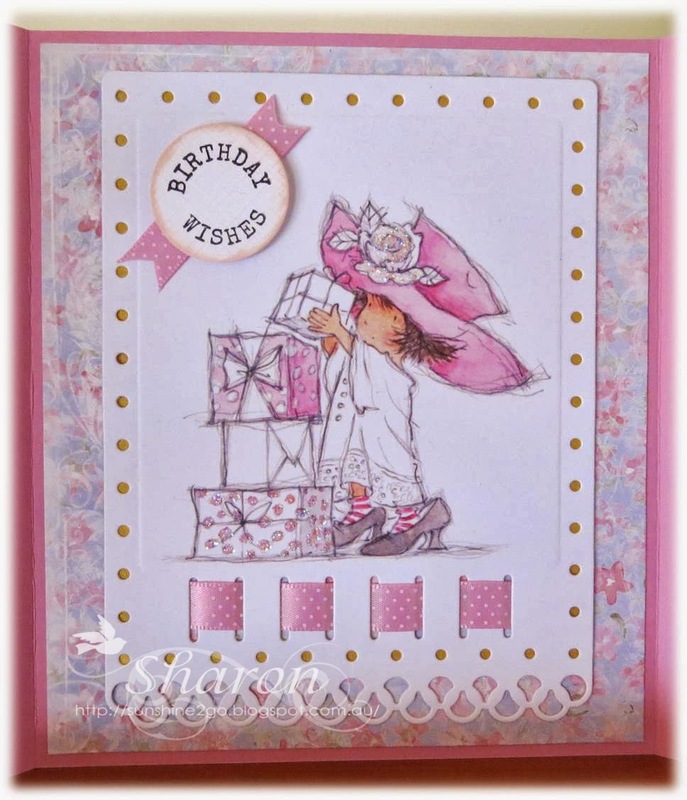 I really enjoyed creating this card and love the idea of the stamps and dies being used together. I hope that you also like the card. 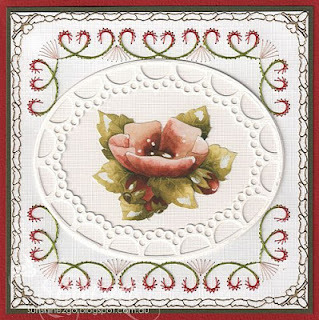 Once again I have used a new pattern by Ann's Paper Art and is available on the new 3d Card Embroidery Sheets a628 #11 in the series. 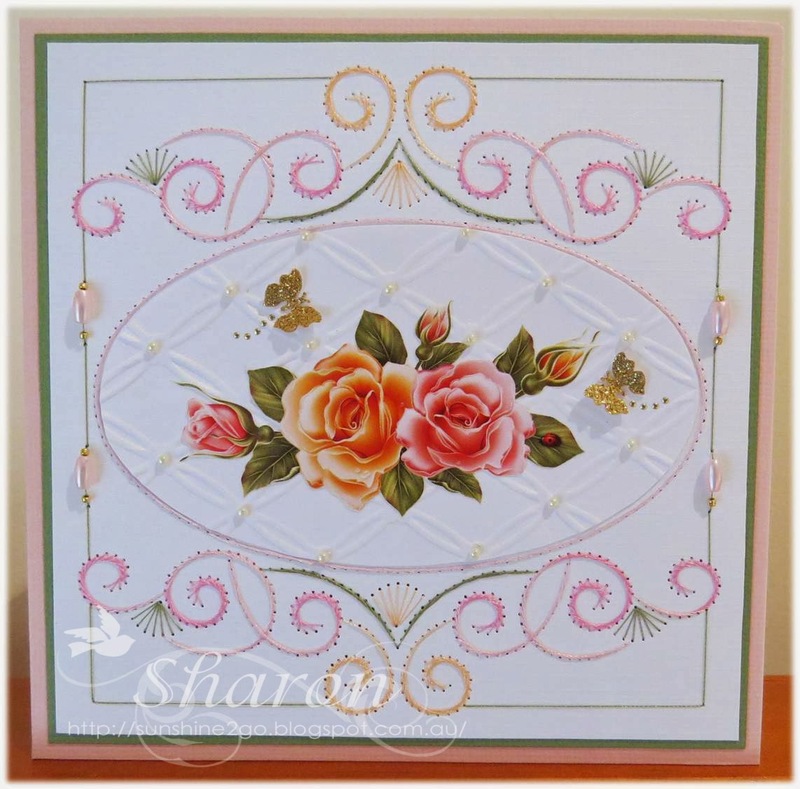 The flowers are from another 3d Card Embroidery sheet a815 #1. The threads are by Mettler Polysheen 2550,2250,5934,1362. 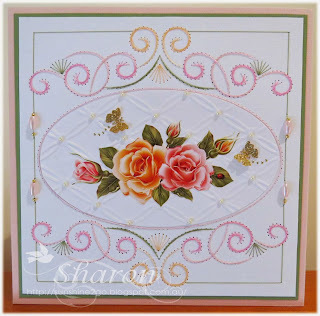 Embossing folder is by Couture Creations "Tied Together"
which I have also added some pearls. The punched butterflies are happily flying around the flowers. versatile and can be used for many occasions. My exchange card for the month of November was for Sue (Buttons) the theme this month was Christmas. 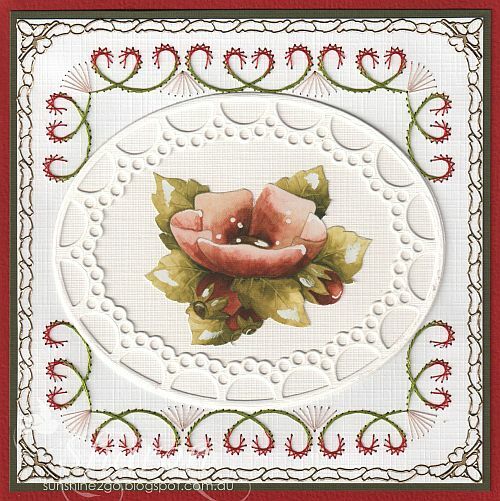 This is a new pattern by Ann's Paper Art a628 and is available on the new 3d embroidery sheets , this sheet is #11 and is part of the second series. The threads are Mettler Polysheen, 2674, 3971, 4230, 4332. I have used Joy! "Winter Paper bloc" as my background scene, the pad has many awesome papers in it. Marianne Creatables, LR0283 & LR0284 made the beautiful village scene, which I added lots of crystal snow to the landscape. The star is from Memory Box, "Star of Wonder" 98167 which I also added some crystal snow to. Beads and gems have also been added to the card. I really enjoyed creating this card it allowed me do something that I have never done before. This week I decided to make a card for a friend. The threads are Mettler Polysheen 0832,1755, 3151, 5934. I made a square using Joy 6002/0134, which I distressed with Tim Holtz, tattered rose. The beautiful image is Nellie's Vintage called " my pal" which I die cut with the Nellie's multi frames MFD055. Corner stickers are Jeje 145 and the lines are Starform. 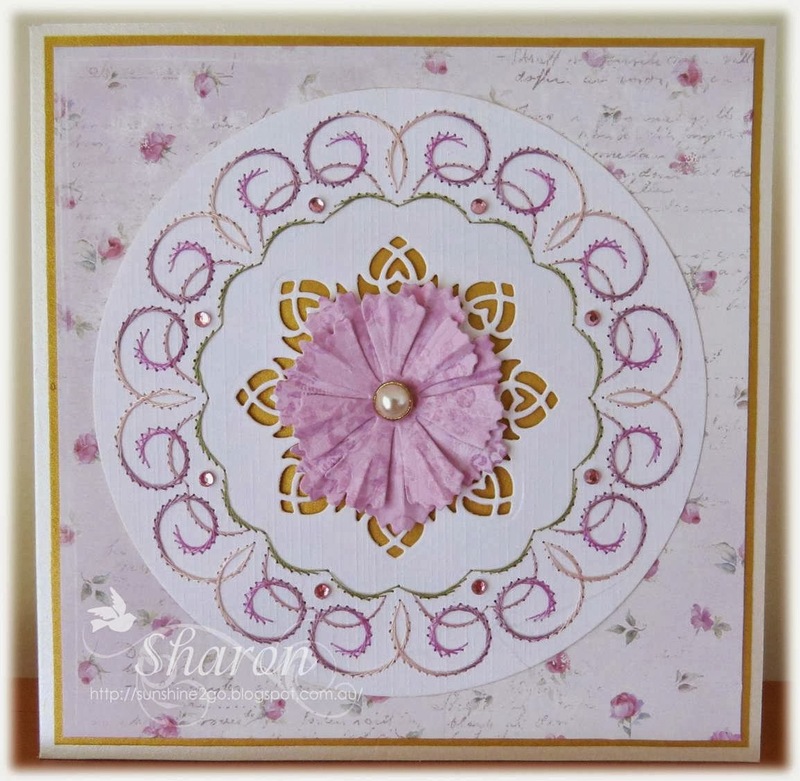 I enjoyed creating this card so very much it was wonderful being able to use the die in a different way. 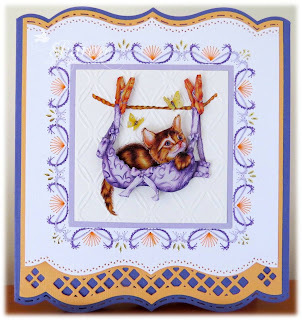 The pattern is a287 and is available from Ann's Paper Art. Threads are Mettler Polysheen 1514,3853, 0134. The new Spellbinder - Curved Boarder Two, S5-201 has created a beautiful edge along the bottom of the card. I coloured one of the boarders with Tim Holtz distress in "weathered wood". by Studio Light called Comic Friends. 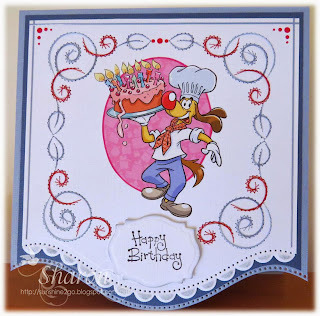 Happy Birthday stamp is from Lili of the Valley which has been die cut with Spellbinder S4-310 and once again distress ink has been used around the edge. Hobbydots have been used on the corners. 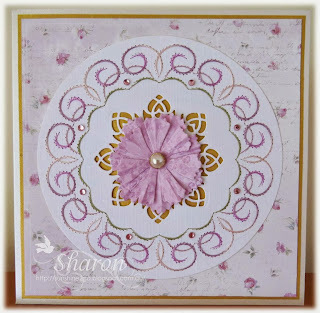 I am thrilled with the way that this card turned out and had a lot of fun creating it. I always struggle making birthday cards for men, although this time I knew what I wanted to make. I made this card for a special friend's husband. Threads are Mettler Polysheen, 0150,0454, 0824, 2101. 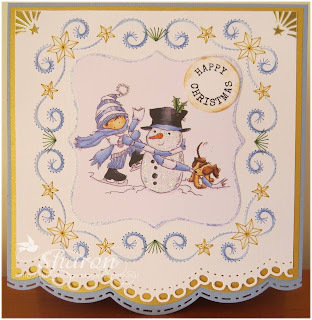 A combination of 2 Spellbinder's have made a wonderful edge along the bottom of the card, E8-003 and E8-002. Wellington embossed stickers sit perfectly in the centre of the card. 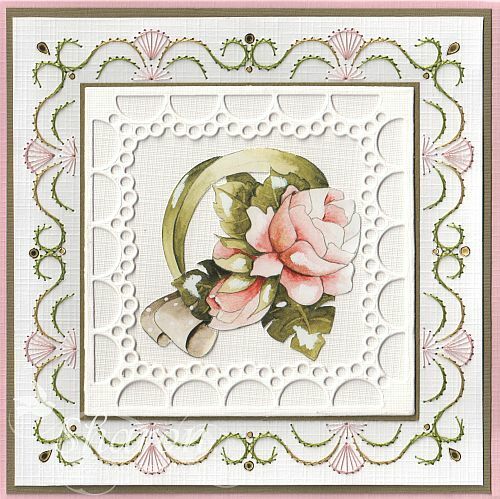 The sentiment stamp is from Lili of the Valley which I cut out with Nellie Snellen, mfd005. I also have another card to make for a male this month, I will need to put my thinking cap on. 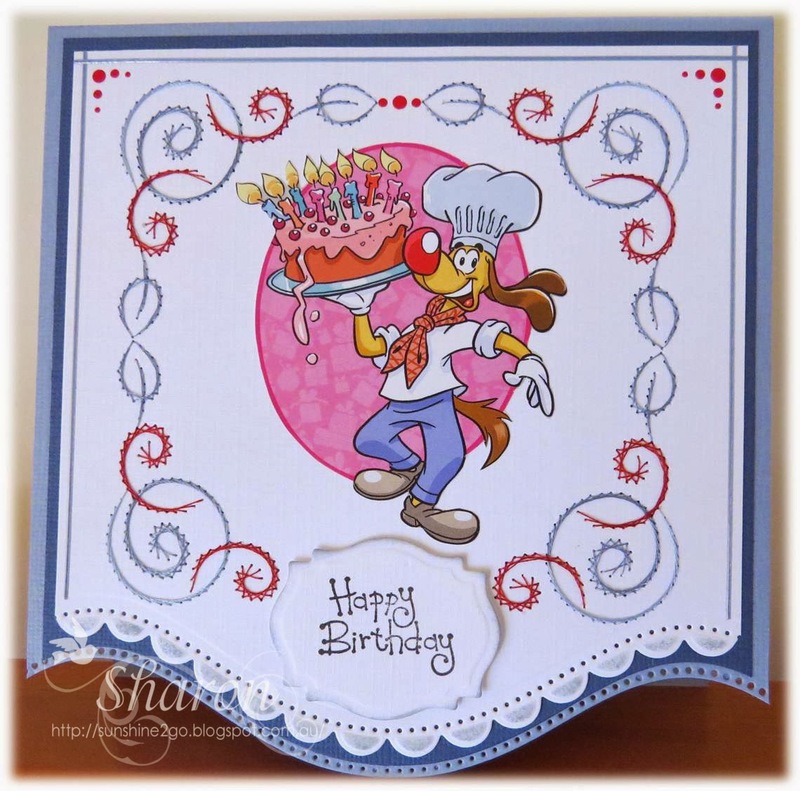 I enjoyed creating this special birthday card and I hope that you like it. My October exchange card for this month at Ann's Paper Forum was for Jackie. The beautiful pattern is a2062, hj82. and is by Ann's Paper Art. Threads are Mettler Polysheen, 0453, 2062, 2650, 2764. I die cut the pattern with Nellie Snellen, mfd055. 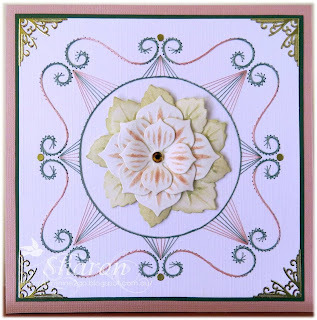 The large circle die is Spellbinder S4-344. Tim Holtz distress ink "Tattered Rose has been gentle ink on the tear-drop die and also on the corner die. Gems have been added amongst the stitching. I enjoyed creating this card for Jackie and I hope that you like it to. Frances had a birthday yesterday and this is the card that I created for her. It is a smaller pattern then normal, yet not small in style. Threads are Mettler Polysheen, 2020, 3150, 5552. 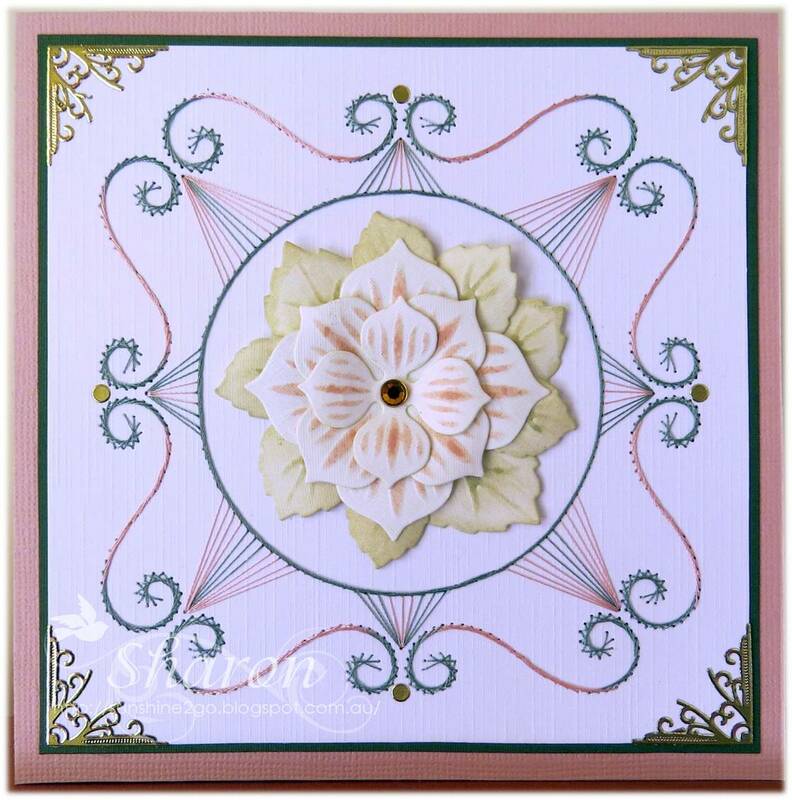 The white linen card has been embossed with Marianne Design DS0915 and then die cut with Spellbinders S5-181. The flower in the middle is Cheery Lynn "Cherry Blossom". Stamens and stickles have been added to the flower. Maja Design's "Vintage Spring Basics". 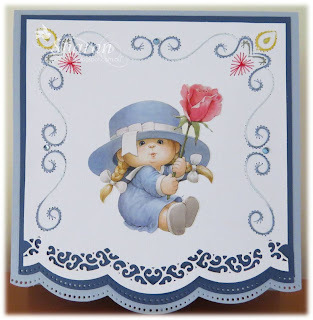 The sentiment is a stamp from Lili of the Valley which has been die cut with Spellbinder S4-190 and attached with a ribbon. Tim Holtz, Distress ink "Tattered Rose" sponged around the edge. Pearls have been added on the embossing. I enjoyed creating this special birthday card and I hope that you like it to. October is a very busy month when it comes to birthdays. A few days ago it was Karin's birthday and this is the card that I created for her. I decided to be a bit more adventurous this time and make my card a little different. I stitched the pattern twice using Mettler Polysheen 630, 2250, 2550,6043. The die is by Marianne design LR0201 it has been around for quite a while and is well worth having. The embossing has been inked with Tim Holtz- Distress ink, Tattered Rose, this one goes with so many things and is one of my favourites. 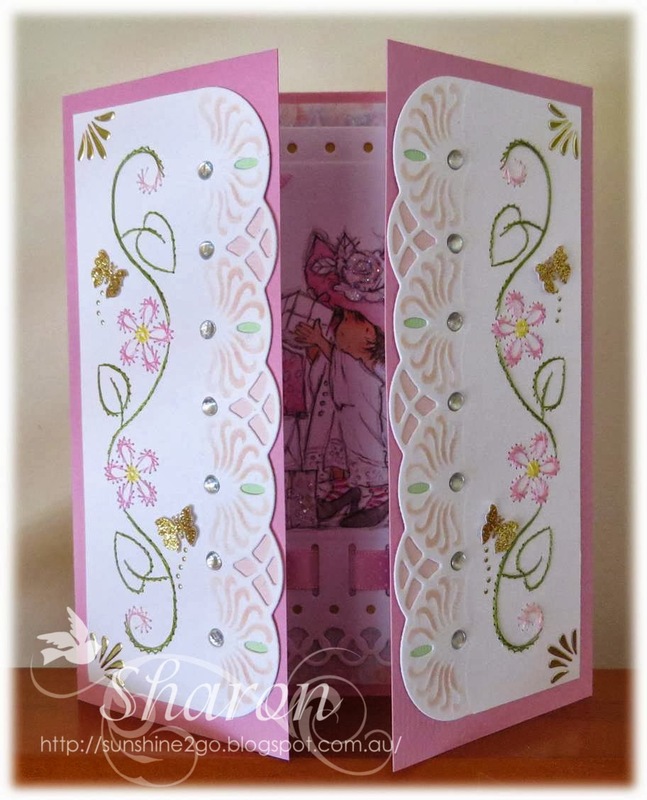 Jewels, stickers, punched butterfly and hobbydots have also been added to the front of the card. 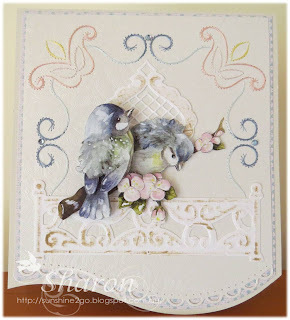 On the inside of the card I have used a gorgeous image from one of the coloured art pads at Lili of the Valley.. I have used Art pad #9 'Party and cakes", which I die cut with Spellbinders S5-135. The birthday wishes stamp is also from Lili of the Valley. The ribbon is Anita's- everyday ribbon. I enjoyed creating this birthday card and I hope that you like it to. Lili of the Valley.......Anything Goes. Today is Ria's birthday and this is the card that I created for her. 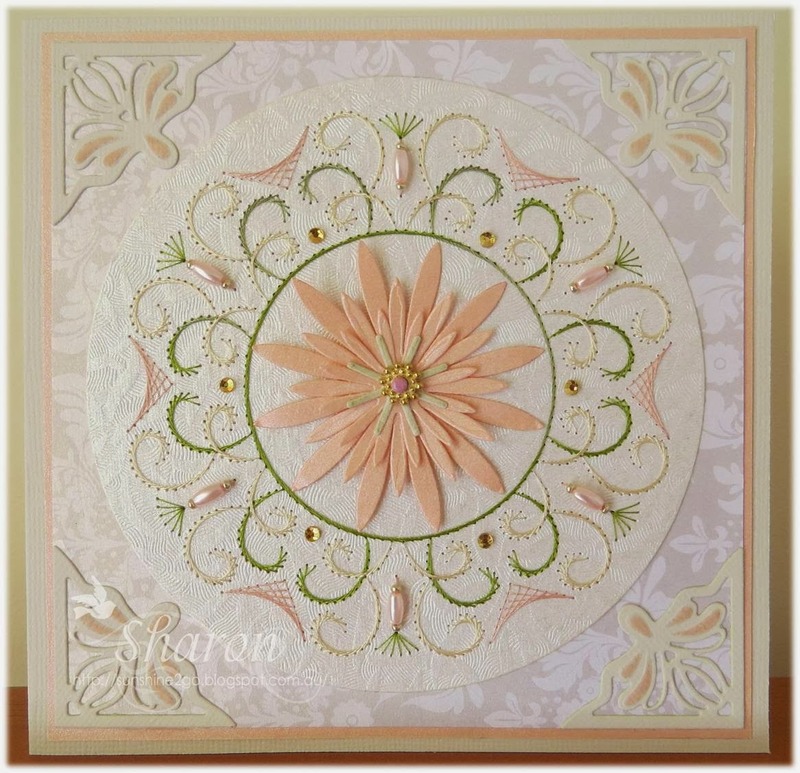 Ann's Paper Art sheet #2, a816. I also used this pattern on a Christmas card that I made last month, it shows how versatile the patterns are, they can be used for many occasions. Threads are Mettler Polysheen, 0821, 2250, 2550, 2920, 3130. The flowers and leaves have been punched out with a selection of Nellie Snellen punches, I added gold onto the edge of the leaves and Tim Holtz Distress ink, "Tattered Rose" has been inked onto the flowers. A pearl has been added to the centre of the flower. 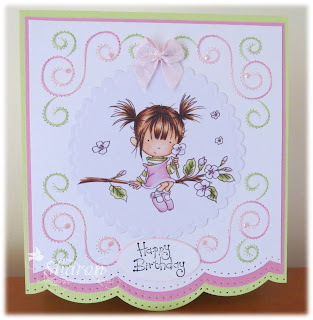 The cute little butterfly has been punched onto glitter card along with some hobbydots. Happy Birthday is by Starform #300. I really enjoyed creating this special birthday card and I hope that you like it as well. Thank-you for coming by an having a look. My September exchange card was made for Sandra. Since it was the start of Spring here in Australia I decided to make a Spring card, although Sandra lives in Germany and it is now Autumn. Threads are Mettler Polysheen 0630, 2560, 6133. The cute little bird die is by Impression Obsession die 058-N.
with Spellbinder S4-190 which has been gently inked along the edges. 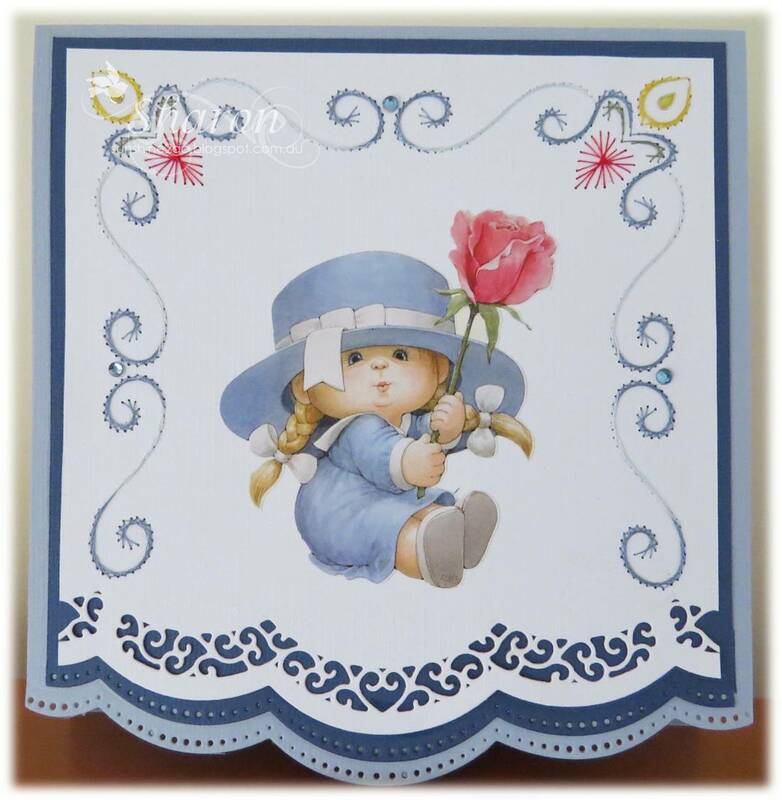 Lili of the Valley sentiment fits perfectly onto Spellbinders S4-190. I enjoyed creating this Spring card and I hope that you also like it. 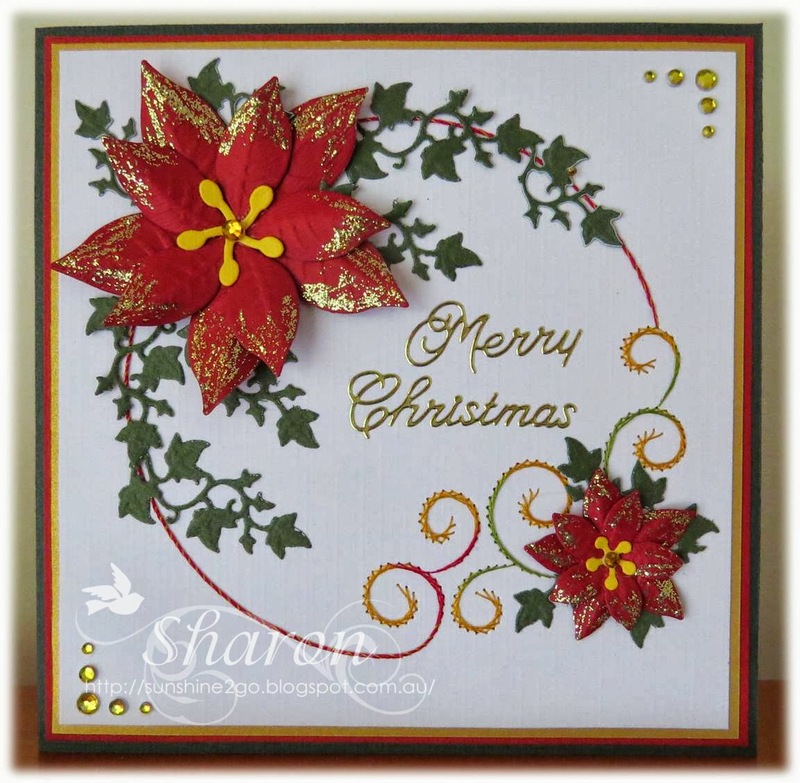 Christmas time is fast approaching, I have started to make some cards ready for the Festive Season. 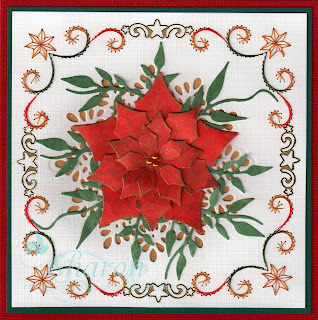 3d Embroidery sheets created by Ann's Paper Art sheet #2, a816. Threads are Mettler Polysheen 824, 2101, 6043. I also added whipping stitch around the red stitching. Marianne Design dies,LR0122, LR0142, CR1253. Gold stickles has been added on the edge of the Poinsettia's. I added gems in the centre of the die and the corners. Again I had loads of fun creating this Christmas card and now I am in the mood for making more. 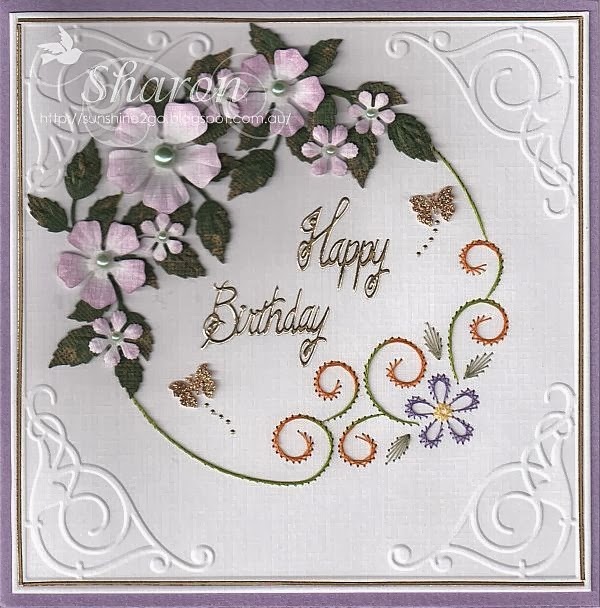 I created this birthday card for Ann from Ann's Paper Art. The pattern is one of the new 3d Embroidery sheets. The threads are Mettler Polysheen, 453, 2166, 2640, 2166, 2762. The circle was die cut using AND004. Cheery Lynn "Sweet Williams" sits perfectly in the centre of the Spellbinder D-Lites S2-021. A pearl brad was added to the centre of the flower. I have used Maja Designs "Sofiero" for the background paper. I had a lot of fun creating this birthday card. It was Robyn's birthday at the end of August and this is the card that I made for her. The beautiful pattern is from Ann's Paper Art, Stitching Sheet books #17, a0213 which is available from Ann's Paper Art. The threads are Mettler Polysheen 1755 and 5552. Leane Creatieff, Multi die flowers #2, 45.8510. I coloured the leaves and the flower with Tim Holtz Distress ink. It is CANDY time at Ann's Paper Art blog spot. 1 Spellbinders Borderbilities set S5-182, 2 patterns by Ann's Paper Art a002 & a452 and a wonderful new sheet from Snoessje. Candy runs till Wednesday the 31st of July 2013 8pm, Swiss time. Be sure to go and check out Ann's Paper Art Webshop to see all the new goodies. Remember Ann sends world wide. This candy will stay at the top of my page till it is completed. This month at Ann's Paper Art I was asked to make my exchange card for Robyn. Threads are Mettler Polysheen 1220, 2910, 3130. 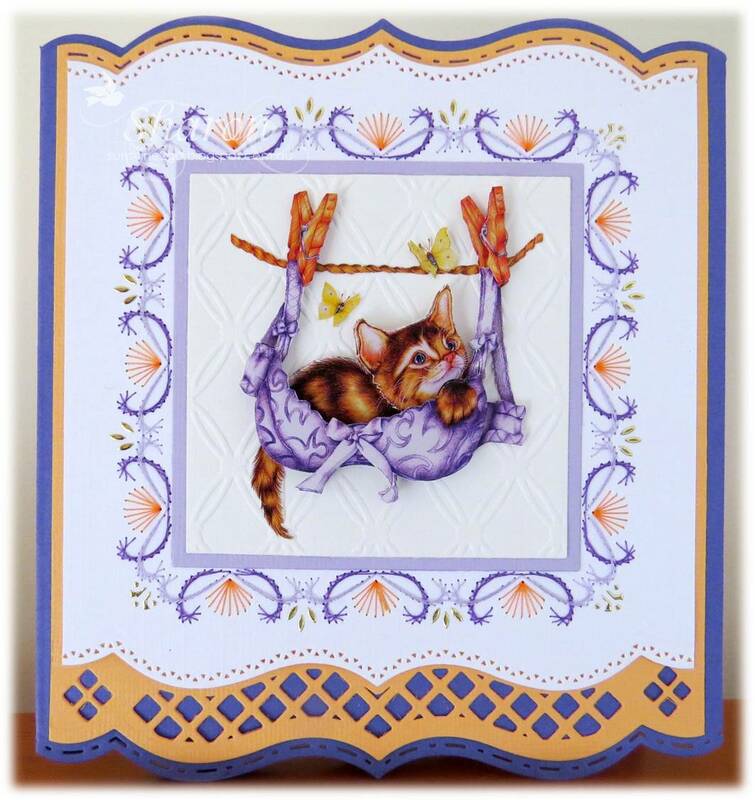 The cute decoupage is by Studiolight "Cats & Dogs 25"
I completed the edge around the pattern using the negative part of the starform stickers #1224. I really enjoyed creating this card and I hope that you also like it. to win a set of Spellbinder Boardabilities S5-182. Thank-you for coming by and have a look. My new spellbinders are getting quite a work out, here is another card that I have created with them. Ann's Paper Art webshop a002. Threads are Mettler Polysheen 463, 622, 1903, 3853, 4071. A very cute Morehead die cut sits perfectly amongst the stitching. I have also added some Hobbtdots and gems amongst the sticthing. Don't forget to add your name to Ann's Paper Art blog for your chance to win this amazing set of Spellinders along with 2 patterns and a Snoessje sheet. Sonni had a birthday this week and this is the card that I created for her. 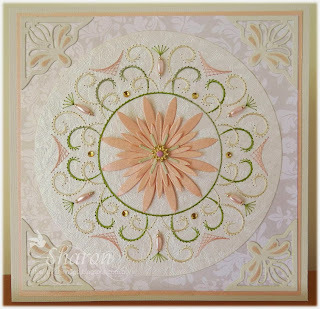 It is a beautiful pattern from Ann's Paper Art a 452. I have the complete set now so expect to see me using them often, I love them. Be sure to add your name to the candy at Ann's Paper Art blog this month for your chance to win a set of these. Threads are Mettler Polysheen.2250,2550, 6141. 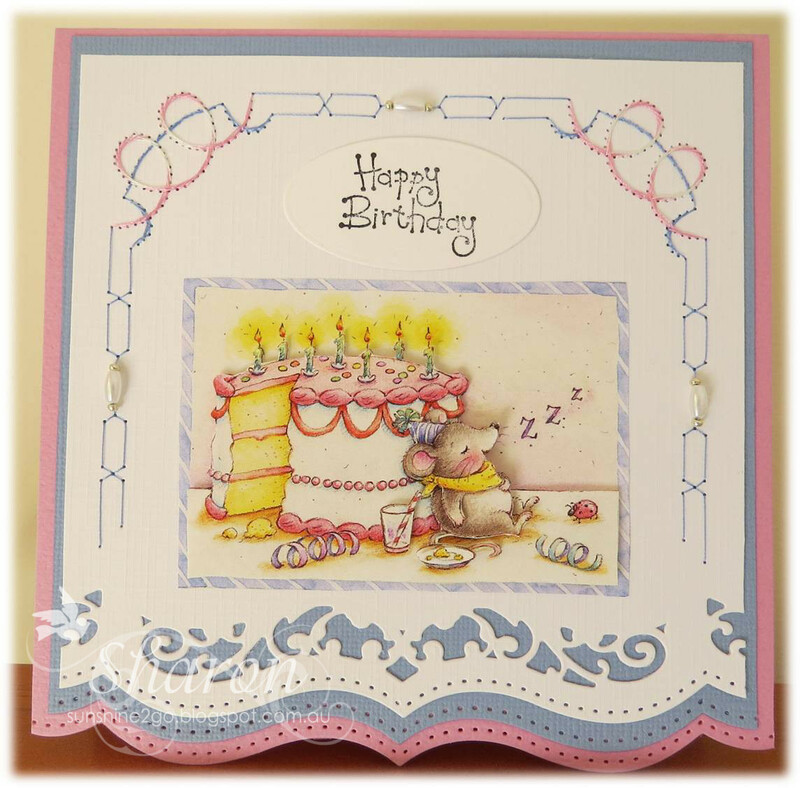 The beautiful little girl and "Happy Birthday" stamp both come from Lili of the Valley, which I cut out with Spellbinder Nestabilities S4-115. I think that these might be the first spellbinders I ever bought. The bow is by docraft, I really must buy myself one of the bow makers and start making my own. I have added pink "Joy"gems amongst the stitching. I would like to enter this card in Lili of the Valley "Pretty in Pink" Monthly challenge for July. This month on Ann's Paper Art, I was asked to make my exchange card for a lovely lady by the name of Jolanda from Belgium. The Pattern stitched is a607 which is a beautiful pattern by Ann and is available from the webshop. Threads are Mettler Polysheen 442,1755, 6133. 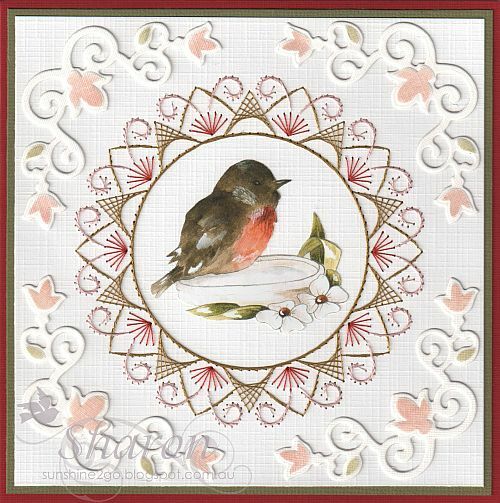 The little robin sits perfectly in the middle of the stitching, the decoupage is a lovely new sheet by Marieke #2715, I love this little bird. 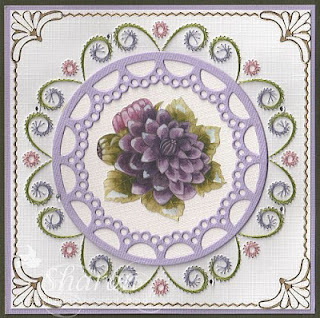 The corner die is by Nellie Snellen mfd031, while still in the die I gentle coloured the flower and leaves with Tim Holtz distress ink. I really enjoyed creating this card it was so much fun. This month is Marjolijn's birthday and this is the card that I created for her. 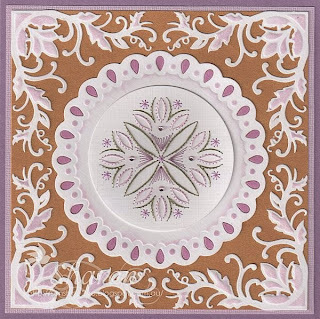 It is a beautiful pattern from Ann's Paper Art #a648. I have not completed the whole pattern as I decided to use my Spellbinders boardbilities S5-181 along the bottom. Threads are Mettler Polysheen 101,2550,3641. 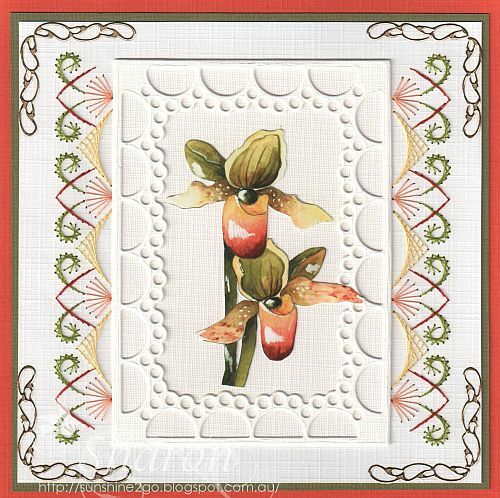 Lili of the Valley "Happy Birthday" has been stamped onto Nellie Snellen mfd057. The cute decoupage is "Tena Wenke" studiolight-STAPCHAR09. I would like to show you all my first lot of cards that I have made for the month of June. 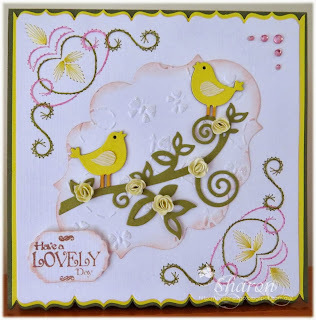 Combining Ann's Paper Art with Marianne Design Craftable stencils and Marieke Design decoupage. All are available from the webshop, Ann sends world wide. The beautiful decoupage is Marieke Design # 2459. Peel off corner stickers are Doodey... DD6811, the lines are by Starform. Threads are Mettler Polysheen, 6043, 3241, 2051. Small gems have also been added. 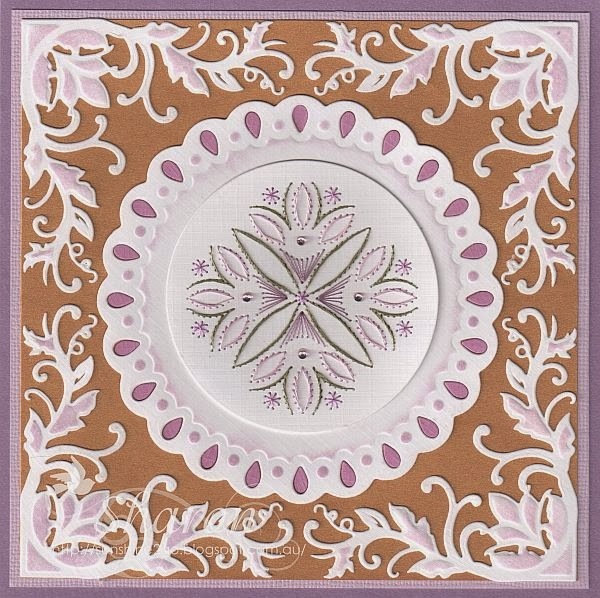 Pattern is by Anns Paper Art #a422, this is combined with MD Craftables CR1240. Mettler Polysheen, 6043, 232, 1755, 1860. Threads are Mettler Polysheen 1761,1514,6043. Peel offs are Doodey... DD65760. Beautiful bright decoupage is by Mariekes Design # 2714. Threads are Mettler Polysheen, 1352,323, 1755, 1860. Thank-you for coming by and looking at my new cards.